20160110 + Up super late today. Got some things done in the office, G playing outside and spilling his hot coco, L&J out shopping for snow pants, D used a Chiltons manual to take aprt the window control panel of his car and tried to get the switch working for the drivers side rear window to work.. D&I headed out to ship a couple sales and practice his manuverability but it was too windy the poles kept blowing over. We made a quick stop at Meijer to get ingredients and Home Depot to get a key copied. 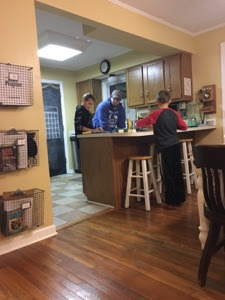 Home and JG&I cooked up a yummy crescent dog dinner with mac-n-cheese, they love to cook. D off to youth group, we watched some TV, I went down and worked out, got leaned up and was up til 2 working.